The Swedish firm plans to open a 30-megawatt power plant next week to test its carbon capture and storage technology, a controversial approach to cutting emissions at coal-fired power plants. A new coal-fired power plant equipped with carbon-capture and storage technology is scheduled to begin operating Tuesday in Germany. The startup of the 30-megawatt plant, developed by the Swedish firm Vattenfall, will mark the latest effort by power-plant operators worldwide to test carbon-capture and storage technology at coal-fired power stations, a major source of both electricity and pollution. Companies and government scientists in industrial and developing countries are researching technologies to capture carbon-dioxide emissions and bury them deep underground, in tapped-out or declining gas and oil reservoirs, coal mine seams or other geological formations. According to the U.S. Department of Energy, such technologies - also known as CCS -- could prevent more than 90 percent of coal-fired power-plant emissions from reaching the atmosphere. That's an alluring prospect, as the U.S. Energy Information Administration expects the use of coal - cheap, abundant and the dirtiest fossil fuel - to more than double to 15.36 trillion kilowatt-hours from 2005 to 2030. But carbon-sequestration technologies have yet to be deployed in full-scale commercial plants, which typically generate hundreds of megawatts of power. The technologies are currently expensive, partly because capturing and compressing carbon dioxide into liquid requires a good amount of energy. Critics also have questioned their effectiveness in keeping emissions sealed underground. Vattenfall has spent €70 million ($99.93 million) and two and a half years to build the Schwarze Pumpe plant, a pilot project to validate its technology. The plant is expected to produce 9 metric tons of carbon dioxide per hour. One of the project's goals is to better understand so-called oxy-fuel combustion, in which the coal is burned in oxygen in a process that reduces emissions such as nitrogen oxides, producing mainly carbon dioxide and water vapor. The company intends to operate the plant for at least 10 years and use the experience to design and run larger demonstration plants in Germany, Norway and Denmark. Results from running those larger, 250-megawatt to 350-megawatt demonstration plants will enable Vattenfall to commercialize its CCS technology, likely between 2015 and 2020, the company said on its Website. Compressed carbon dioxide from the Schwarze Pumpe will be sent to a depleted natural gas field owned by Gaz de France in northern Germany. Vattenfall's pilot plant is one of a series of projects carried out in recent years to test and improve CCS technology around the world. 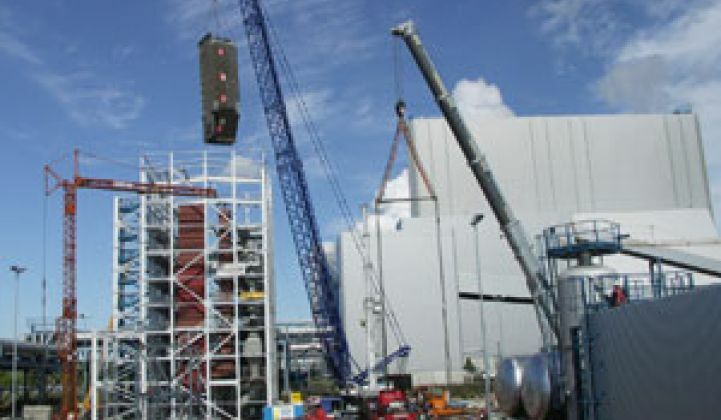 In 2006, the Elsam power plant in Denmark began running a CSS pilot project supported by research institutes and companies from 11 European countries. Last month, Canadian utility Saskatchewan Power Corp. said it was soliciting CCS project proposals as part of a plan to retrofit one of its power-generation units at a coal-fired plant (see Canada to Beat U.S. to Carbon Storage). The project, which involves a 100-megawatt generation unit, is expected to cost about C$1.4 billion ($1.34 billion), the company said. Construction is scheduled to begin in 2011. The carbon dioxide harvested from the project will be shipped to nearby oil fields to help extract the black gold from hard-to-reach reservoirs. The United States also has harbored ambitious plans to develop and commercialize CCS technology, including a $1.5 billion project to build a 275-megawatt power plant equipped with CCS technology. The U.S. Department of Energy, which had committed to cover more than 74 percent of the project expenses, scrapped the plan last year after raising serious concerns about the ballooning cost (see DOE Pulls Back on FutureGen's Reins). The DOE has since restructured the FutureGen project and now plans to invest $1.3 billion equipping multiple new coal-fired power plants with CCS systems. The United States also is a member of the Carbon Sequestration Leadership Forum, an international research consortium carrying out a series of projects worldwide (see the projects list). CSLF member countries, which also include China, India and several European nations, contribute about 75 percent of all man-made carbon-dioxide emissions globally.